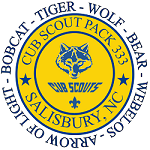 Join Webelos Scouts of the Central NC Council June 19-22, 2014 as they sleep, eat, and live like real Science Investigators. Registration information and Leader’s Guide will be available here in January 2014. Contact DCRoof@aol.com or 704 637-1272 if any questions or concerns. So grab your lab coats, dust off your microscopes, clean your safety glasses, and join us for a great week-end of SCIENTIFIC INVESTIGATIONS.